WITH ALL THE BOBA FETTS A-F! but I don't have any one to play with other then my bro but then I thought "Who else plays STCG" so here I am asking you "Who plays/played STCG?" ...No I don't want to know where you live so I can fly out just for one game with someone other then my big bro. I collect the cards, but i dont play the game. I have a couple of cards, but I don't seriously collect them, or play the game. Alo, that is off topic, and therefore spam. Feel free to instant message him about it. Oh wait THAT'S off topic as well oh no spammmm! My post was to stop the spam. Get back on topic, shall we? Play nice. For the record I don't have any cards. No one is not "playing nice." 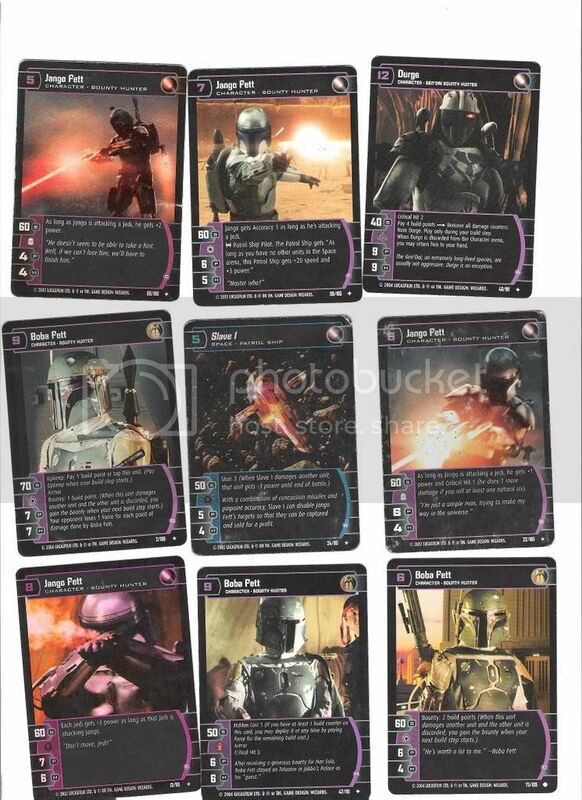 I have two cards, titled "Boba Fett," and "Boba Fett's Blaster." The first two links in my first post there are the pictures that you requested. Ok cool they appear interesting. Didn't you guys actually agree on something at one time? I had a bossk card. But i lost it. hey I know this is off topic but I just got a new PW (I lost my old one) so I'm back. And I wanted to say thaat I was talking about the NEW STCG not the old lame one. this is the "cool" STCG not the old lame one. THis is the one I wan't to know if anyone plays. I used to play it,but I recently gave my deck to a friend who played it alot more than I did. Mine got washed in my clothes.